Recent years have seen many new rail under road grade separations built across Melbourne, yet they don’t turn into swimming pools every time it rains. You can’t use the rest of the network as a model – flash flooding is a common sight across Melbourne’s poorly maintained rail system – so how do they stay dry? The first step is to prevent water from flowing into the trench. Taking advantage of existing slopes is the easiest way. Or regrading the surrounding soil to slope away from the cutting. Adding small kerbs alongside the top of the cutting wall will redirect water. As will exploiting the massive concrete walls used to stop idiot motorists from crashing down onto the tracks. But that might not be enough – sometimes upgrades to the local drainage system are required. To ensure that stormwater doesn’t overflow the surrounding streets, and breach the trench walls. This means that the only water to end up in the trench is the rain that falls upon it. Drains between the tracks collect any rainwater. It then flows downhill to the lowest part of the trench. Where a pump then sends it back out again, via a web of pipe work. So how big do the pumps need to be? The Furlong Road grade separation on the Sunbury line at Ginifer station is a deep hole – the pump station supplied by Aquatec Enviro‎ has some impressive specifications – 3.2 metre outside diameter, 10.74 metres deep, and capable of pumping out 440 litres/second of water. 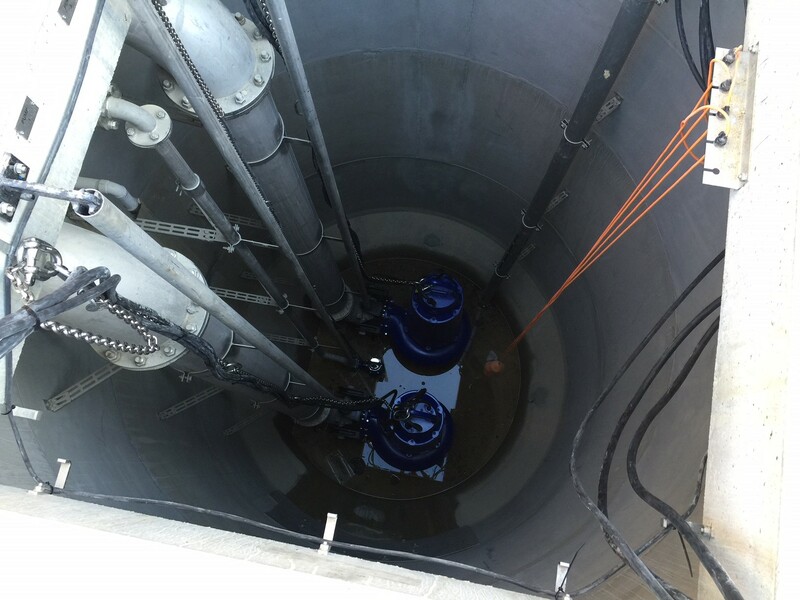 Main Road at St Albans has a longer approach cutting, so the pump station needs to remove more water – 3.2 metre outside diameter, 9.74 metres deep, and capable of pumping out 490 litres/second of water. While the Blackburn Road grade separation on the Belgrave/Lilydale lines has more complicated requirements. The long trench on the approach to the station has a pump station for drainage – 2.3 metre outside diameter, 5.78 metres deep, and capable of pumping out 480 litres/second of water. But thanks to the depth of the cutting, groundwater also needs to be removed from the cutting, requiring a second pump station – 1.0 metre outside diameter and 6.0 metres deep, but only needing to remove 2 litres/second of water. And finally, the infamous ever flooded pedestrian subway – it has a 1.8 metre outside diameter and 3.5 metres deep pump station, capable of removing 50 litres/second of water, hopefully to prevent a repeat of this. And the cost to run them? Taking the figures for Furlong Road, a 480 litre/second capacity pump lifting water 10.74 metres, assuming 60% pump efficiency, requires a 85 kilowatt motor to drive it. In reality you might provide two separate pumps taking half the load, which appears to be what happened at the pump stations Aquatec Enviro supplied to the LXRA. The same logic was applied at Ormond station on the Frankston line – multiple 30 kW pumps were installed, backed by a 220 KVA generator to take over if mains power failed. According to Sustainability Victoria’s “Energy Efficiency – Pumping Systems” best practice guide, a fully loaded 100 kW electric motor, assuring 90% motor efficiency, costs $16 / hour to run or $373 / day to run, if you’re paying 14 cents a kilowatt hour. So not expensive to run, but still far more costly than the free drainage provided by gravity. 2.1 This standard sets out MTM requirements for drainage systems within the rail corridor. It covers the technical requirements for drainage of the track formation, supporting embankments and cuttings. 2.2 This standard does not cover drainage from carparks, buildings, overbridges, footbridges, airspace developments, external developments, access roads, roads outside the rail corridor, council drains or properties adjacent to the rail corridor. 2.3 This standard does not include culvert design or design of other infrastructure used to allow overland flow to cross the rail corridor. Cess drains are surface drains located at the formation level at the side of the tracks. They remove water that has percolated through the ballast and is flowing across the capping layer towards the outside of the formation. Cess drains are primarily intended for protect the formation by keeping it dry. Catch drains (also known as “top drains”) intercept overland flow or runoff before it reaches the track. Catch drains are generally located on the uphill side of a cutting or catch water flowing down the hill and remove it prior to reaching the cutting. How much water the drains are expected to handle. 9.2.1 Flood design shall protect all track assets from the 1% AEP flood level (1 in 100 year ARI event) and permit the unrestricted operation of trains by not overtopping the capping layer. The capacity of the drainage system shall take into account the rainfall intensity, the water runoff to be managed and the particulars of the location. And how big the pump stations need to be. 16.4 The pumped system shall provide storage capacity for a 2 hour, 1% AEP (100 year ARI) event in case of pump system failure. A 2 hour period has been determined as an acceptable response time for maintenance staff to reinstate the operation of the pump system after the high water level warning is triggered by the alarm system. 16.5 The pumped system shall provide sufficient redundancy in the pump and pipe sets that when one unit or inlet/outlet pipe is temporarily offline (e.g. maintenance or fault), all drainage requirements can still be satisfied. 16.6 The pump station shall have a connection for a backup generator and pump in case of power failure. The connection type shall be compatible with equipment used by emergency services and MTM. While the Level Crossing Removal Authorty’s “Cross Drainage Assessment – Rail Under Road” for the Edithvale Road, Edithvale project details the effect that rail under road grade separations might cause to the surrounding area. The following criteria and design objectives have been established as a framework for assessing the level crossing removal. The final design requirements will be further developed a part of the design process. To prevent the underside of the ballast flooding from a 1 in 100-year Average Recurrence Interval (ARI) event (without freeboard) estimated in accordance with Australian Rainfall and Runoff (AR&R, 2016). To meet the requirements stated in the Metro Trains Melbourne drainage guidelines (Metro, 2016). To meet the flooding requirements of the relevant drainage authorities (typically Melbourne Water and the City of Kingston). In accordance with the requirements of the relevant road authority and the relevant drainage authorities. To limit the impact of the project on major drainage and overland water flows to the satisfaction of the relevant drainage authority(s). This will typically require assessment of changes (afflux) in velocity, depth, erosion, duration of inundation. As well as the elements that make draining a road under rail grade separation hard – or simple. A preliminary flood and cross drainage assessment has been undertaken for Edithvale Road, Edithvale level crossing removal. The purpose of the report is to identify matters relating to cross-drainage that may need to be incorporated into the level crossing removal project design. The proposed works will not occur within a defined land subject to inundation overlay or special building overlay. Furthermore, available topographical data indicates that the proposed works occur along a local ridge where surface flows will generally discharge away from the rail corridor. Due to the characteristics of the site, in particular the ridge crest location of the existing rail corridor, it is considered that the project will not have a significant effect on cross flows and consequently flood risk within the surrounding area. Potential increases in rainfall intensities from climate change and the effect that this may have on the standard of flood protection for the railway, road assets and other properties will be considered for cross-drainage design. Given that the proposed works will not impede or impact overland flow paths or existing flood areas no further mitigation is required as a result of the project. As the design progresses, management of the local drainage network and catchments should generally be incorporated into the design and further analysis of major overland flow paths should not be required. The City Loop tunnels have a similar problem – how do you prevent water from running down the approach ramps and into the tunnels! Their solution is simple – a concrete lip at the top of each ramp, preventing groundwater from entering. Windsor Station? A natural drainage fail I expect. Better drainage would be good there, as would better protection against storm water run in along that entire cutting (Windsor station-about halfway in between Alma Rd and Inkerman St).